Braine-l’Alleud innovates and offers a real alternative to paper invoices! 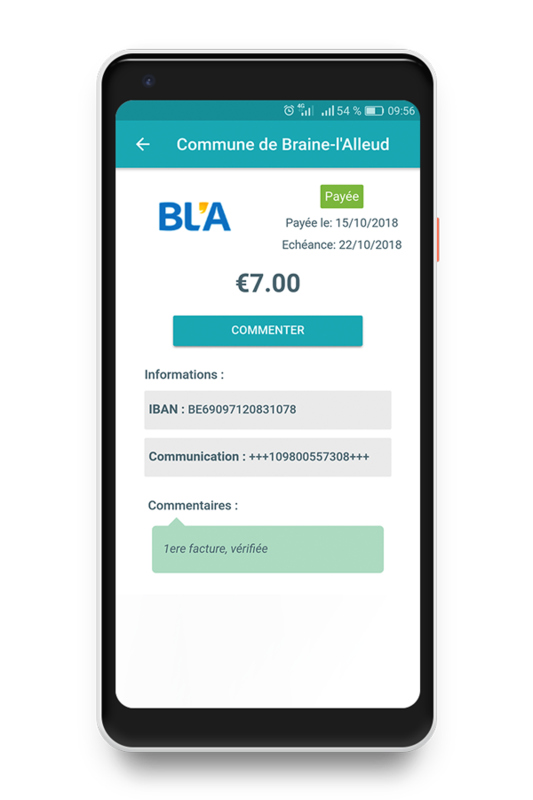 The municipality of Braine-l’Alleud is currently implementing a pilot project with Digiteal to offer the concerned citizens an innovative solution to manage and pay bills for extracurricular activities and hot meals. The first results are very encouraging! This pilot project takes place thanks to another example of good collaboration between an invoicing software (Onyx de Civadis in this case) and Digiteal. See for yourself the ease with which parents can pay their paper bill and request to receive their next one electronically in their Digiteal environment. Tired of encoding structured communication? Fed up with payment reminders because invoices are getting lost in your many incoming emails? Or just had enough of that many paper binders? Same for us! That’s why we developed Digiteal! The most efficient way to process invoices is not paper or email, but real electronic invoicing. The Digiteal platform allows you to centralize, manage and pay your invoices very easily without encoding! And it’s free! Certified as a payment institution by the National Bank of Belgium, Digiteal provides a complete service from the reception to the automatic payment of invoices (reinvented direct debit: you have control). WHAT ADDED VALUE FOR ME? Digiteal brings simplification and optimization so you can manage and pay your bills like a pro! Overseeing and enjoying the really important things, that’s all you have to do! YES! You are not drowned in advertising and your data is not resold. It is the company, the municipality, the association that sends your invoice that offers you this service because together, you reduce your ecological footprint! Pay and ask to receive your next invoice in “My Digiteal”. MY SUPPLIER DOESN’T OFFER DIGITEAL YET!? ARE YOU A INVOICE ISSUER? Create your company account and let us guide you!